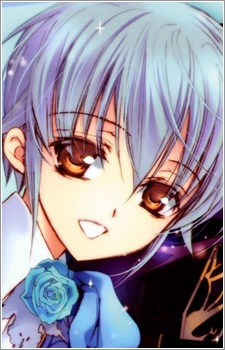 Asagi is the Knight of the blue rose and is not often at school because he is mostly sick. When he is sick, Asagi stays by himself inside the greenhouse filled with roses, and ironically his illness may be an allergic reaction to roses, as he appears fine when he isn't around them. Lives alone in a western-style mansion just pass the Kaede shrine. He sometimes invites Itsushi-sensei, Ninufa or Kaede to participate in his mysterious "tasting parties". He specializes in "Alchemy" or rather "science". He is also very cute, cute enough to be a girl. He is the sacrificial rose that was made in the past to help seal the devil's seal. His memories and Kaede's memories are not real, so he plans to use his body to restore the seal. In chapter 11 he is saved from the seal. His rose is not found in nature, because they replace the Yellow Rose with the Blue Rose. But even so he cares a lot about Anís. Once he asks her if she would accept his love and when she does not get what he says, he changes the subject about the love potion thinking it might be too soon.